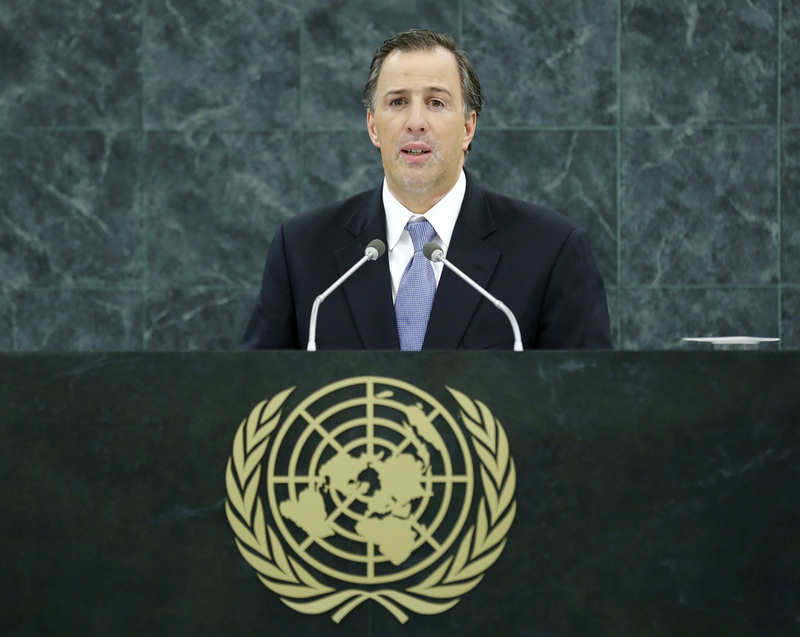 JOSÉ ANTONIO MEADE KURIBREÑA, Secretary for Foreign Affairs of Mexico, said that in the past two weeks, his country had experienced an unprecedented and simultaneous arrival of two hurricanes, Ingrid and Manuel, one on its Pacific coast and the other on the Atlantic. Such increased vulnerability underscored the urgency to act. He welcomed the Secretary-General’s decision to hold a climate change summit in September 2014. He also condemned the attacks against civilians in Nairobi and expressed condolences to the families of the victims, saying such acts demonstrate the need to remain vigilant in the fight against terrorism. He noted that Mexico supported a political and peaceful solution to the Syrian crisis through diplomatic initiatives, in accordance with the agreement reached between the United States and Russian Federation to eliminate all chemical weapons in Syria. On Security Council reform, he said, the organ must truly represent the international community by not merely extending privileges to the few. In confronting the world drug problem, he said that a more effective and comprehensive response that encompassed a health perspective and a framework for respecting human rights was needed. He welcomed the Antigua Declaration in OAS, as a first step towards the United Nations’ 2016 Special Session. On the fight against organized crime, he stated that it must follow the rule of law. In that context, when the privacy rights of any citizen by any Government were invaded, a full investigation must be undertaken and violator held accountable. On free trade and building mechanisms that facilitate the free movement of people, goods and capital, he referred to the Pacific Alliance, which had a spirit of plurality and transparency. Despite the success of the Millennium Development Goals, inequality and a lack of participation and access to development continued to affect the poorest, both in developing and highly developed countries. The post-2015 development agenda must address the gap between the haves and have-nots, he said. He also underscored the importance of issues relating to persons with disabilities, migrants and indigenous peoples. On a national level, he noted that Mexico was undertaking initiatives to democratize access to quality education, telecommunications, the financial system and social security. NASSIROU BAKO ARIFARI, Minister for Foreign Affairs, African Integration, La Francaphonie and Beninese Abroad of Benin, said that, two years from the 2015 deadline established to achieve the Millennium Development Goals, States had made major efforts to meet their targets. Assessments had shown, however, that least developed countries were falling far behind, despite significant progress. Meeting the Goals had become a crucial Government priority, and it had mobilized many resources. Benin expected to achieve at least five of the eight Goals. It was important to ensure that the post-2015 agenda included and prioritized those Goals that had not been achieved on time, he said. There was a galvanizing vision to build a unique programme covering all points to ensure that everyone on the planet could be on a sustainable development path, so that they could all have access to shared prosperity. It was important that situations deemed most worrisome receive the most attention, he said, expressing strong supported for the “a life of dignity for all”, as cited in the Secretary-General’s report. He said Istanbul Programme of Action should be perceived as an integral part of the post-2015 agenda. It would ensure the transition of half of the least developed countries out of extreme poverty. The project already enjoyed strong support from the United Nations and some development partners, he said, calling upon the Assembly to assist in that proactive initiative to help those countries make the jump towards industrialization. That would enable them to create decent jobs and make the most of their demographic resources, he said, welcoming the Secretary-General’s Education First Initiative.